Sarah Vincent once tipped the scales at 122 kilos. She worked at the back of a hospital making calls and answering emails, but at three o’clock every afternoon she would answer a very special call – the call of the dim sim. Running the gauntlet of smokers in the hospital car park one day for her daily dim sim fix, Sarah had an epiphany: just like those nicotine addicts, who continued dragging on their cigarettes even while attached to IV drips, Sarah was an addict and was slowly killing herself with food. She knew if she didn’t act soon it would be too late, and her husband – who had only narrowly survived cancer – and their two young children would be minus a wife and mother. She also knew she had been going on crash diets since the age of thirteen and nothing had ever worked: the watermelon diet; eating nothing but cabbage soup; ancient fruit extracts from Indonesia; packaged food delivered to your door; eating according to your blood type. She had learnt to eat mindfully, and had eaten calmly and awarely throughout the day, then had mindlessly eaten chocolate biscuits in bed at night. She was either dieting and fighting constant food cravings, or giving in to the cravings and eating everything in sight. She didn’t know how to eat normally any more. She didn’t know what normal was. But then Sarah met the nutritionist who would introduce her to the low-carb, high-fat eating approach known as Banting, which leaves you feeling full and reduces your cravings. 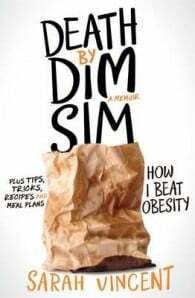 In her memoir Death by Dim Sim she details with hilarious honesty how she managed to lose 40 kilos using this method, her childhood battle with her weight and her lifelong struggle with anxiety. And because she wants you to lose weight too, she shares the recipes and tips that helped save her life. She is now slimmer and fitter than she’s ever been and she never wants to see a dim sim again. Sarah is a professional writer and playwright. She is a graduate of the RMIT Professional Writing and Editing program, membership officer at Writers Victoria, resident at Varuna with mentor Patti Miller and was part of the 2015 and 2016 Emerging Writers Festival. Another exciting round of New Releases in March!